I just received some information from your web page sent by Barry Dahl and tried to access your site, without success (probably due to the time of day). I will try again tomorrow. Halvor Osterkil was the younger brother of my gr grandmother, Margrete Torsteinsdatter Bonsletten Osterkil. I found him and his daughter, Ida, living with my gr grandmother in the 1900 census of Dell Rapids and am so pleased to have more information about him. I have a copy of the Lutheran Church of Dell Rapids centennial publication, and in it is a picture of a Sunday School class taken in 1897 with Halvor Asterkil (?) as one of the teachers. Margrete and Halvor had a brother, Peder Torsteinson Sorkilmoe, who also lived in Dell Rapids and a sister, Johanna, who lived in the country near Baltic, SD. Johanna married Ingvald O. Brende, I believe her second husband. Would be happy to exchange more information with you. Thanks for your reply. I could not access your web page this morning either, but I found it by doing a search. The address that Barry gave me was different from the one you just sent. I also found Jon Erickson's message and several others. An interesting morning! Actually, of Halvor's family there were four brothers and three sisters living in the Dell Rapids area in the early days. I just mentioned the ones whose names I know. This information is in a letter written by my uncle Peter Anderson (Margrete's son) in 1946. I am sorry now that I didn't ask him or my mother about them when they were both alive. From the "Stjørdalsboka" the children were: Margrete (b. 1829, d. young), Peder Sørkilmoplass (1833), Johanna (b. 1837), John (1839), Margrete (1841), Lars (1844), Beret (1846), Johan (1849), and Halvor (1855). According to the 1900 census, Halvor emigrated in 1875. Do you have the ancestors of Halvor and Margrete? I have them back to the late 1600s from the Stjørdalsboka. If you want to send me your snail-mail address, I will mail you a pedigree chart as well as a copy of the picture. Margrete and her husband, Anders Jacobson, had eight children, the youngest born in SD in 1886, the year after they arrived. My grandmother, Beret, had eight children; Anders (next to the youngest) moved to Canada and had 10 children; Mikal (the youngest) had four children but no grandchildren; and the rest either didn't marry or had no children. A second cousin in Canada and I have been trying to track them all down. Is your Aunt Irene in good health? Would she be able to visit with me? I live in Rapid City and get to Watertown occasionally. I was in Dell Rapids over Memorial Day doing some research and would like to get back there soon. Any questions you have about Dell Rapids or the family, please let me know. Have just visited The Evjen Osterkil Genealogy pages, and I can tell you that this mail is from the Osterkil farm in Hegra, Norway. We are also owner of the old Bonsletten farm. As you see I send you two pictures of the Osterkil farm (which now a days is called Østkil),one picture from 1905 and a new picture. I'm sorry to say that there are no houses at old Bonsletten farm anymore, but we have many members of the Bonsletten family here. Hope to get a mail from you. This is a farm near where Halvor Osterkil grew up. It is located near Hegra, Norway. 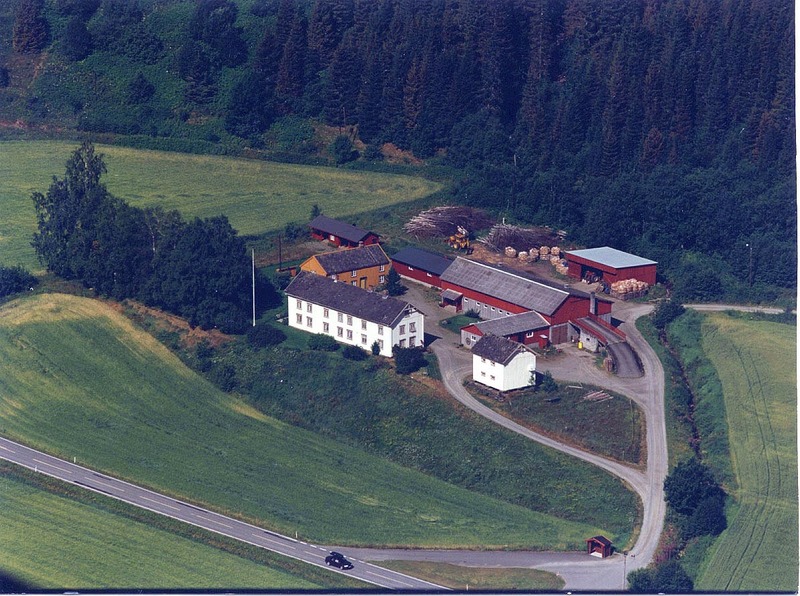 This is a farm near where Halvor Osterkil grew up in Norway. To: , "Dan & Paula Evjen"
As you know, mostly all of the descendants of Torstein and Ingeborganna Bonsletten left for Amerika. I do not know if Halvor an Margretes sister Beret did. She moved to another place in Norway. But I have foud some relatives of you here i Stjørdal. 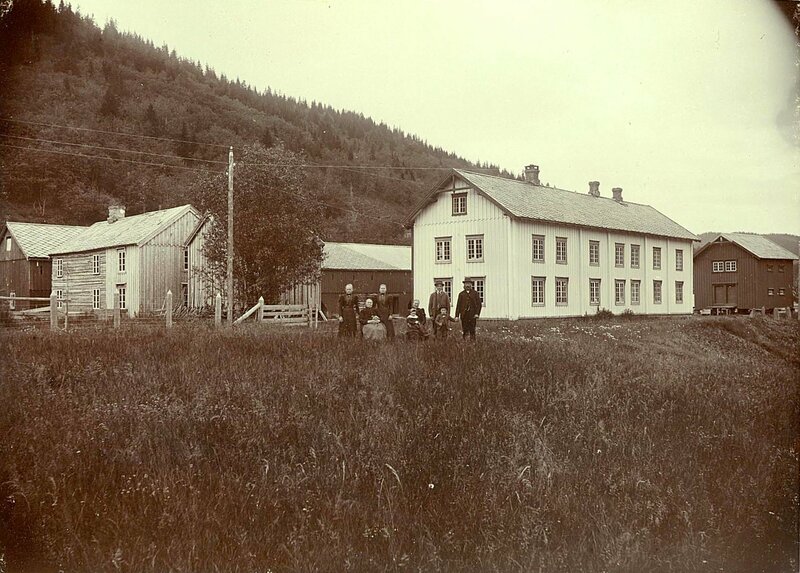 The brother Johan had a daughter Bergitte (born 1866), who was married to Sivert O. Hognes in Stjørdal. Their gr.grand son is Svein Tore Hognes. He is at the time the only one I can find in this area who is a descendant from your Bonsletten-family. I have talked to Svein Tore, and his is interested to get in touch with you. His mail adress is svein.tore.hognes@ktv.no. you can see your family on the farm Upper Bonsletten under the population-counting in the year 1865. At that time two housholds was living on the small farm. The couple Ingebrikt and Johanna had, as you see, two goats and two sheeps. Than you have Torstein and Ingeborganna, the son Jonn and his wife Sara, the son Halvor and the gr.daughter Lina. I think Peder, Margrete, Lars, Beret and Johan had moved out at that time. The main household had 2 cows, one pig, 2 goats and 8 sheeps. The houses was very small and the land was very steep. I think the total areal was about 40 dekar. It was interesting hearing from you, especially the story og Irene. A few months ago a man in Norway saw Dan's webpage and contacted him. Dan sent the message on to me. This man, whose name I don't have with me (I am in Texas, not at home), is the owner of the Bonsletten farm where our ancestors lived in Norway. I believe he owns surrounding farms as well. I contacted him and he said we had a relative still living in the area, Stein Tore Hogne. I sent Stein a message and just got a response yesterday. Stein descends from Johan, brother to our ancestors, Peder, Margrete and Halvor. Johan had a daughter in 1866 before he married. This daughter, Bergitte, stayed in Norway with her mother when Johan emigrated. She is Stein's great grandmother. Johan came to America in 1876 with his wife and two children. He took the name of John Flamo and farmed near Dell Rapids. Lina's daughter, Inanda, went back to Norway in the 1950s to visit relatives--I wonder who they were? We came to TX to escape the winter in SD, but it has been cold and rainy here. Hope all is well with you.